Best practices: I haven’t been the best at practice. Best practices in data preservation call for redundancy. I used to be a bit better with this than I have been recently. Until last year, for example, I kept everything on Microsoft’s OneDrive. The client never did work well on macOS, so I ditched that. iCloud would be Apple’s equivalent, but it was a bit pickier. Especially when my base model rMBP (128GB) is considered. So off the cloud I went to a 3TB external drive. Of course, that drive began to fail.1Which shouldn’t have been surprising: that model was known for failure and I was lucky to get 6 years out of it. Finder locked, transfers slowed to a chug, and the (in)famous macOS beachball taunted me. 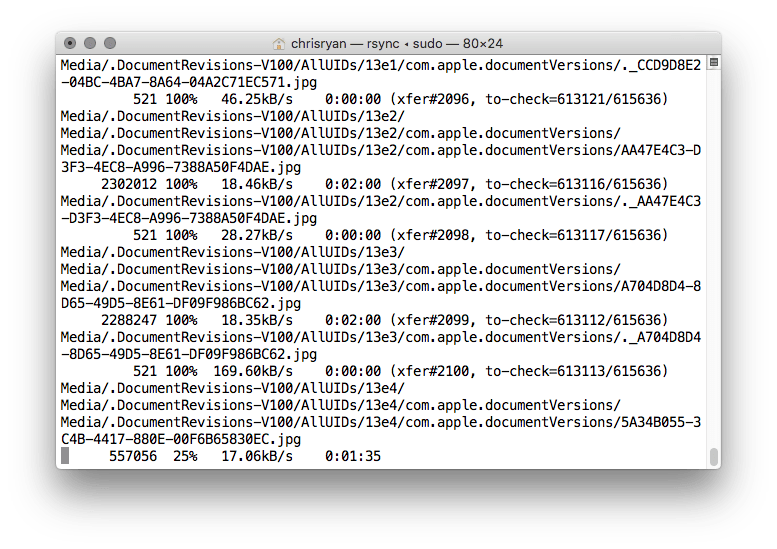 Cutting it short, copying all 615,636 files over (should they all be transferrable and not beyond recovery) to a new drive is on track to take a few days. Lesson (re)learned. In 2004 I lost every digital photograph I had ever taken when the Maxtor hard disk they were stored on failed spectacularly. I also just got myself an unlimited home internet connection, so maybe a service like Backblaze is in order. 1. ↥ Which shouldn’t have been surprising: that model was known for failure and I was lucky to get 6 years out of it.